Muff Red Cross chalked up a double at the All Ireland First Aid competition held in Loughrea in County Galway recently. The All Ireland First Aid competition is an annual event that brings together Red Cross volunteers from throughout Ireland. The Muff Red Cross won the prestigious Cadet All Ireland in First Aid. They also won the Jane Williams Perpetual Cup for Youth Section, which tested their knowledge of the history and work of the Red Cross both in Ireland and overseas. Bernie Rutherford Chairperson Muff Branch, congratulated the Muff team, made up of Charlotte Lynch, Rachael Edwards, Sorch Hegarty and Oran Hegarty. She said that the achievements of team highlighted the quality of First Aid services of youth members and their commitment and dedication to learning lifesaving and personal development skills and making a contribution to the development of local their community. 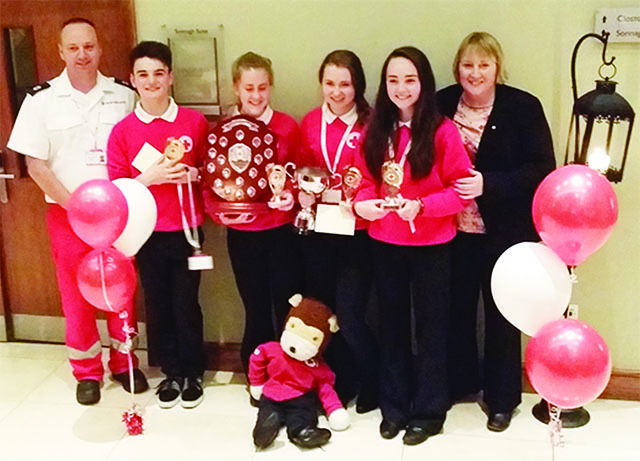 “Their win will raise the profile of the importance of First Aid skills in our daily lives. I wish all of them continued success in the future,” she added. It promotes excellence in “human behaviour” and competing teams demonstrate their competence in dealing with casualties in a caring and empathetic way. Each team had to tackle a series of staged scenarios, all with numerous casualties. Actors portray the casualties and the make-up is of theatrical standard and extremely realistic. Each casualty has a judge marking the treatment given. The competition also entailed demonstrating excellent leadership and teamwork skills, communication and problem solving techniques. Every year the Irish Red Cross are an important provider of first aid training and first aid cover at events and this event highlights the level of expertise available across the country. The Muff Branch would also like to give a ‘big thank you’ to the teams families for their continued support and to the team trainers (Michael Monaghan, Bernie Rutherford and Donna Rutherford) and all leaders in Muff Branch for giving of their time to train and help the young members develop their skills.